A terrible darkness has fallen upon Jacob Weisz’s beloved Germany. The Nazi regime, under the leadership of Adolf Hitler, has surged to power and now hold Germany by the throat. All non-Aryans—especially Jews like Jacob and his family—are treated like dogs. When tragedy strikes during one terrible night of violence, Jacob flees and joins rebel forces working to undermine the regime. 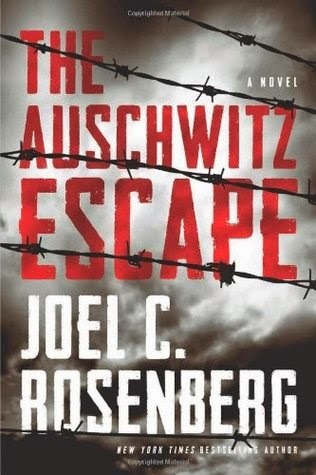 But after a raid goes horribly wrong, Jacob finds himself in a living nightmare—trapped in a crowded, stinking car on the train to the Auschwitz death camp. What comes to mind when you think of Auschwitz? For me it is death, evil, unadulterated horror. The idea that a person came up with the idea of a death camp for a group of people is just sickening, and that there were people that followed along with this idea of torturing with joy, leaves me dumbfounded. How is this even possible? Yet, it did and it wasn't all that long ago. Auschwitz was a death factory. I knew of the horrors that the Jewish people faced during WW2 from history, but I didn't know before I read this story that a group of men were determined to escape and spread the word of what Hitler and his kind were doing behind these fences. I just assumed that somehow or another, word spread out like a ripple affect and that is how the world knew about what was going on. I was wrong. The world didn't know what was going on at the hands of Nazi's. The Auschwitz Escape follows Jacob Wiesz. He was not a true person in history, but he is based on the ones that did make it out. Auschwitz doesn't come into play till a quarter of the way through the story. Because of this, we get to know Jacob and what his life was like as a Jew in Germany, then as a person on the run and in hiding, and finally as a prisoner at Auschwitz. We get to witness the escalation of the hostility to the German Jews, then to the surrounding Jewish communities. I believe Joel C. Rosenberg handled the setting of Auschwitz well. He presented it historically, but respectfully to the audience of the book. The brutality of the death camp was displayed in many ways, but it was viewed through that of Jacob and what he saw and heard. If he was around for certain things, you got to see it. If it was happening on the other side of camp and he wasn't there, you did not. The brutality wasn't just thrown in for the sake of having it, but when it was there, it had a purpose. Jacob's time at the camp is a good part of the book. Sadly, the attempts to escape for many didn't end well, so Jacob has to bide his time. And in doing so, we are introduced to the running and layout of the camp and the people who have been forced to reside there. This book was heartbreaking and thrilling. I honestly had no idea where this story would go or who would make it. Each character played such an important roll. The underground network that worked its way through the camp was amazing, but everyone was vulnerable. There were several nail biter moments in this story. Sounds like a must read for historical fiction lovers...which includes me. Great review. R Merr, I think it is a must read for any historical lovers. It's a powerful story.